Media captionTornados have been in use since 1979. Police have had to move on a number of drivers who have parked dangerously to watch a flypast of RAF Tornados as part of the jets' farewell tour. They took off from RAF Marham in Norfolk at 14:00 GMT and flew over RAF College Cranwell in Lincolnshire. However, from as early as 08:00 GMT police were issuing warnings about "drivers stopping unsafely on the A1122" in Norfolk in order to watch. Nine planes took part in the display. Tornados first took to the skies in 1979 and will be retired from active service at the end of March. The aircraft have seen action in several conflicts, and were first used in live operations during the Gulf War in 1991. To mark their retirement, the planes flew over much of the country on three different routes for the farewell tour earlier this month. Hundreds turned out each day to watch them above about 35 military stations and landmarks including RAF Lossiemouth in Scotland, RAF Valley on Anglesey in Wales, and the National Memorial Arboretum in Staffordshire. 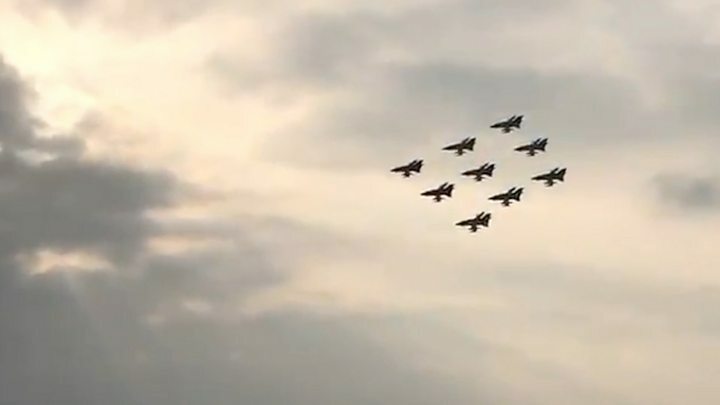 The nine-plane formation flypast to Lincolnshire attracted keen plane-spotters from early on Thursday morning prompting police to warn about the dangers of stopping at the side of the road. Officer Commanding IX(B) Squadron, Wing Commander James Heeps said a landowner had agreed people could park on part of White Road close to RAF Marham, and just off the A1122, for a charitable donation. Although the Tornados will no longer to be used in active service after the end of March, they will still be flown as part of air force training.